Amarillo may well be the grand champion of decommissioned highways (or grand loser, depending how one looks at it): of the eight US routes that have served the city, five of them no longer exist. That could be a misleading statement, though, so to clarify: it is not that the roadways themselves have disappeared. 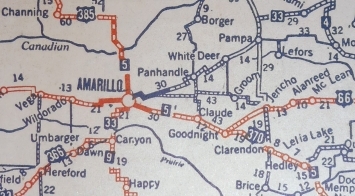 Rather, Amarillo was originally served by several shorter branch routes, which were later swallowed up by extensions of longer routes. As a result, several US route numbers that once graced the streets of Amarillo have been retired -- perhaps more than any other city. 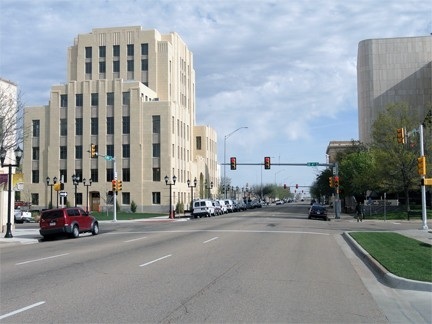 ​When the US routes were first commissioned in 1926, Amarillo found itself at the junction of north-south US 385 [i] (which ran along Fillmore Street), and east-west US 66 (which headed west of Fillmore via South 6th Avenue, and originally went east of Fillmore using South 10th Avenue). Also, US 366 [i] came into town heading northeast from El Paso. It met US 385 at Canyon (about 16 miles south of Amarillo), but according to route logs, instead of ending there, it overlapped with US 385 up to Amarillo. So it came in on Fillmore, and it may have ended where it junctioned US 66 at S. 10th. But it also may have been signed up to the main highway junction at the center of town: S. 6th and Fillmore. 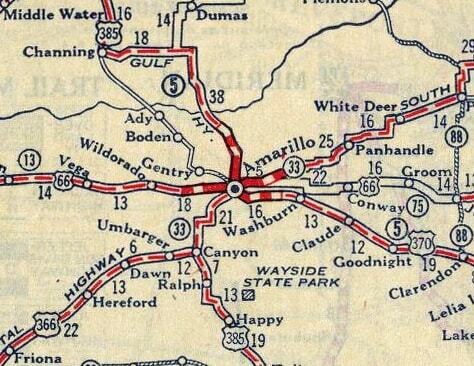 Meanwhile, in 1928, US 164 [i] was commissioned: it served traffic coming into Amarillo from the northeast. 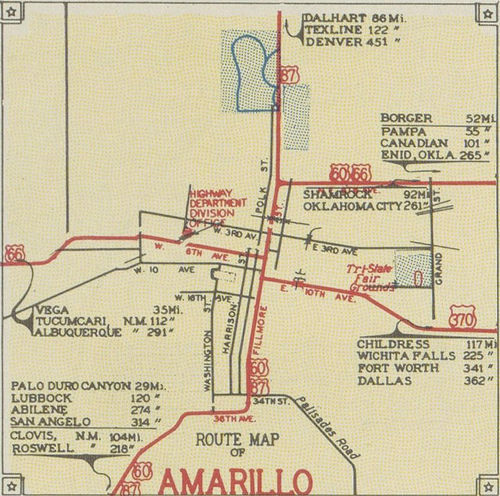 US 164 arrived via North 8th Avenue (now Amarillo Boulevard), so the designation could have ended where it met US 385 (at Fillmore). However, it is more likely that US 164 would have been co-signed down to meet US 66 at S. 6th (possibly the same endpoint as US 366, which makes one wonder why US 164 was not numbered as a northeastward extension of US 366 instead). 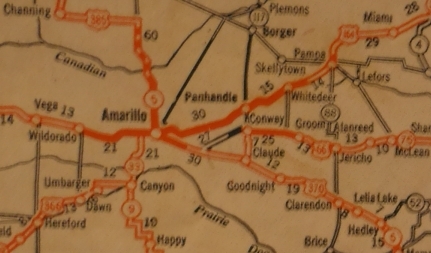 By the late 1920s, Amarillo was served by those five US routes, which led out of the city in five different directions, and which branched out to seven within a 16-mile radius. But as soon as 1930 rolled around, the route numbers began to change, and by the end of that decade, four of them were history. 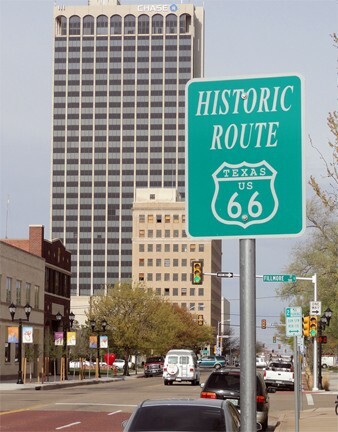 First, US 60 was extended eastward from Missouri to Amarillo. The westernmost segment of this extension was along what had been US 164, so that was the first of Amarillo's route numbers to be retired. 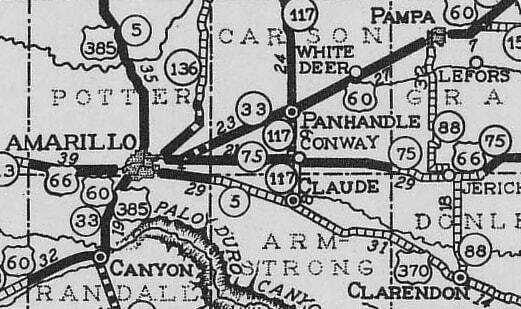 US 60 would have had the same endpoint as US 164 for a year or two, before it was extended again: this time westward out of Amarillo. And since that extension was along US 366, it brought about the demise of that route. 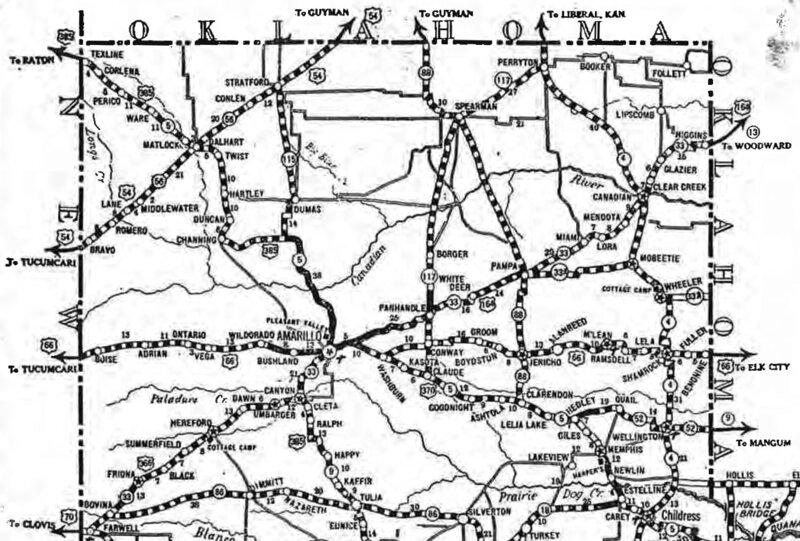 In about 1935, US 385 was replaced by a southern extension of US 87. Then in 1939 a southeastward-expanding US 287 eliminated the US 370 designation. 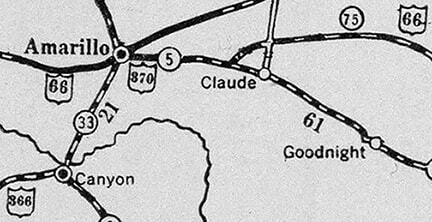 And the fifth (and final) US route to be removed from Amarillo was US 66, which was decommissioned in 1985. What this means is: every one of the seven original US routes that branched out of Amarillo in the 1920s has been renumbered. ​That was US 385; originally westbound US 66 was to the right on 6th, while eastbound was straight ahead. Later, the segment of Fillmore between Amarillo Blvd. [nee N. 8th] and that point also carried US 66. Straight ahead was the beginning of US 366, and later US 370. That is the perspective of a driver at the historic west end of US 164, and later at the end of US 60.